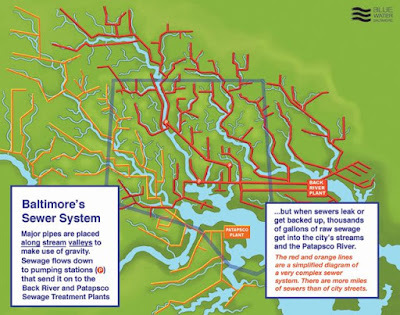 Baltimore was one of the last major cities on the east coast to construct a proper sewer system. The City’s inability to install sanitary sewers until 1915 tarnished the appeal of what was otherwise a successful city. Several commissions throughout the nineteenth century formulated plans for a sewer system for Baltimore, but were unsuccessful because of economic conditions and fighting between political parties. The Great Fire of 1904 proved to be the final factor in the construction of a sewer system in Baltimore. A new spirit among the residents arose from the ashes of Baltimore and there was a drive to rebuild and improve the city. On April 7, 1904, the Sewage Enabling Act passed in the Maryland legislature. It provided ten million dollars for a new sewer system in Baltimore. Construction began in 1907 and the sewage treatment plant was operational in 1915. Public health improved, as did the image of the City. Today, the Back River and Patapsco wastewater treatment plants serve 1.6 million people and treat up to 250 million gallons of sewage per day.